Only a month left to view the From the Land exhibition! From the Land takes as its starting point the 800th anniversary of the Charter of the Forest, this gave the common man rights to glean from royal land. In this exhibition artists use different landscapes for inspiration and material for their works. 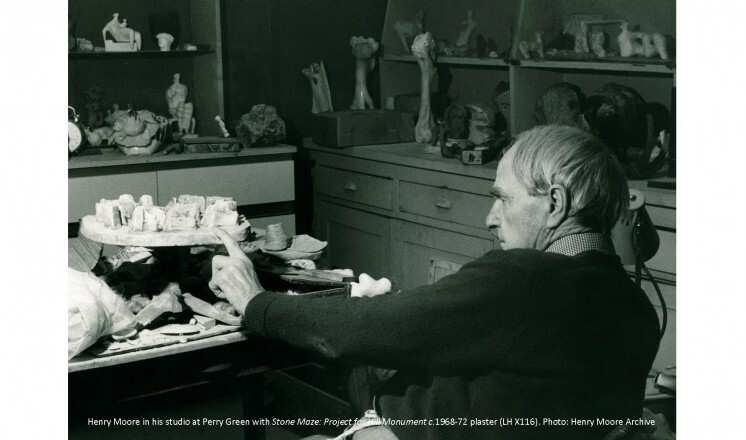 The process of taking from the land is important for two sculptors in this exhibition, Henry Moore and Ewen Henderson. There are also works on display by fifteen other artists including John Piper, Paul Nash and Evelyn Gibbs. This exhibition captures a different perspective on Moore's work; sculptures are presented in the gallery environment instead of outside within a landscape. Alongside work in this exhibition are displayed objects from our own archaeology collection. In this context they portray a new meaning. Every twenty minutes a specially commissioned new poem by David Marcus Clark is played. The haunting words are spoken over the sounds recorded in a windswept landscape taking you on a journey through the exhibition. "Just stumbled across this exhibition but absolutely loved it, a great combination of works. Thank you". "The From the Land exhibition is superb. The talk beforehand set the exhibition in context. I wonder if exhibitions like this could reconnect us with the land, our sense of place. Thank you"
"Second visit to exhibition. Brilliant thank you. This exhibition and Radev collection are the best that have been here. Thanks again". "Brilliant exhibition! (From the Land) Unbeatable combination of paintings, sculpture and ceramics. More modernism and ceramics please. Thank you". "Excellent and well put together. Interesting juxtapositions and choice of exhibit"
We also have merchandise including sketchbooks, prints, keyrings and magnets of Henry Moore's work and many items including books about Paul Nash and John Piper. Don't miss out on seeing Britain's most famous sculptor's artworks here at The Collection. You can buy tickets for the exhibition online or at The Collection reception desk. Tickets also allow you unlimited access to the exhibition until 7th May.